Infiniti are targeting the premium hatch segment with their Q30 - the kind of buyer who'd be looking at an Audi A3 or a Mercedes A-Class. This is the smallest model yet from Nissan's luxury brand and arguably the most attractive too. The Infiniti Q30 is an up-market five-door hatchback that's based on a Mercedes A-Class and also aims at the premium compact hatch segment that car competes in. This design breaks new ground for the Japanese firm and is British-built. Despite the Far Eastern roots, the Q30 is built at Nissan's plant in Sunderland. Infiniti is not a common nameplate in this country, although the marque may be familiar if you follow Formula 1; they are a key sponsor for the Renault F1 team. For those of you unfamiliar with Infiniti, the brand was introduced to North America in 1989 to rival Toyota's luxury brand Lexus. Europe saw the first Infiniti back in 2008, although thirsty engines and unfamiliarity with the badge have kept sales on the low side. The Q30 looks to change that by aiming at the premium compact hatch segment and cars like Audi's A3, BMW's 1 Series and the car it's based upon, Mercedes' A-Class. Not only have Infiniti produced a genuinely attractive vehicle - vital in this sector - but it also offers a wide range of engine options and much of the quality buyers seek in this segment. This British-built model could be a game-changer for Infiniti. It would appear Infiniti have learned from past mistakes and are offering a wide range of both petrol and diesel engines. The most economical/slowest option is a 1.5-litre 109PS turbodiesel that has been supplied by Renault. Next up is a 1.6-litre turbocharged petrol with either 122 or 156PS. A 2.2-litre Mercedes-sourced 170PS turbodiesel is the next rung up the performance ladder, offered only with 7-speed auto transmission and the option of 4WD. At the top of the tree is a 2.0-litre petrol with 211PS that is also turbocharged. This final engine is only available on 'Premium' and 'Sport' models. Handling is safe, predictable and not a great deal different to the Mercedes A-Class, the underpinnings of which lie beneath the surface. Like that car, there's the expected MacPherson strut front suspension as seen in the vast majority of front wheel drive vehicles. At the rear is a sophisticated independent multi-link set-up as you'd hope from an upmarket car. While 'SE' and 'Premium' models are biased towards comfort, 'Sport' models are lowered by 15mm to reduce roll and provide more entertaining cornering. A seven-speed dual clutch automatic is an option, as is four wheel drive, that AWD system standard along with the 2.2-litre diesel engine on a Crossover-style QX30 variant. The Renault-Nissan alliance has been working with Mercedes for quite some time now with such diverse models as Mercedes Citan van and the smart range benefitting from Renault platforms. On this occasion, it was Mercedes helping Renault-Nissan out with the platform and selected engines from the A-Class range. Although there's the danger the Q30 will steal sales from the A-Class, you can guarantee the Three-Pointed Star branding will be enough to keep Mercedes' baby safe. Besides, apart from the overall proportions and a few switches inside, you'd never know the two were related. In terms of style, Infiniti once again rely on an interesting selection of creases, curves and angles - as well as that imposing grille - to make a statement. It could have gone horribly wrong but somehow doesn't. There's real muscle to the shape, while detailing such as the chrome squiggle by the rear door adds some visual interest. The cabin isn't the most exciting of places but it doesn't look out of place on what's supposed to be a premium offering. Material quality is good, while there are plenty of personalisation options too. Boot space is a reasonable 368-litres. Prices sit mainly in the £20,000 to £30,000 bracket and the Q30 offers three basic trim levels; entry-level 'SE', 'Premium' and 'Sport'. The 'SE' will kick off at just under £20,000 for a 120PS front wheel drive manual car, with the 1.5 litre diesel an extra £1,000 or so. Standard equipment includes a 7" touchscreen Bluetooth infotainment system, manual air conditioning, all-round electric windows, auto headlights, leather steering wheel and leather gearshift gaiter. One thing you don't get is alloy wheels: you'll need to option those separately or move up a trim level. On top of desirable 18" alloys, 'Premium' models also get LED front foglights, heated body colour mirrors and additional chrome detailing, not to mention greater levels of tech and comfort inside. 'Sport' models get a 15mm drop in ride height, 19" alloys, colour-coded sills, dark chrome exhausts and a black front grille with a sportier front bumper. Cars fitted with the 2.2 diesel also gain active noise cancellation to help improve refinement. Go for that engine and one of the swanky trims and you'll top £30,000 without too much difficulty. This is fairly common amongst competitors however. If you're interested in the QX30 version with its raised ride height, wider wheelarches and roofrails, bear in mind that this derivative only comes with top 'Premium' or 'Premium Tech' trim and with 2.2-litre diesel power, automatic transmission and AWD. 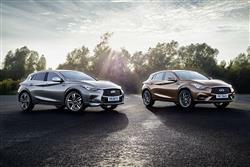 QX30 pricing starts from around £30,000. All models receive seven airbags, hill start assist, brake assist, collision warning with active stop and the usual ABS, stability control and traction control. There are no prizes for guessing that the cheapest Q30 to run will be the 1.5-litre turbodiesel, which is capable of an impressive 72.4mpg on the combined cycle, while emitting as little as 103g/km of CO2. It should be noted that certain options such as larger wheels can worsen both economy and emissions; pay attention to the spec sheets if this is a worry. Even the 2.2 turbodiesel with AWD and an automatic gearbox in a fully loaded trim level still manages a reasonable 55.4mpg, with 133g/km of carbon being produced. For comparison, the base 1.6-litre petrol with 122PS manages 48.7mpg with carbon emissions of 134g/km. The question is, would you rather save the money on the purchase price or at the pumps and when you come to tax your vehicle? It's also worth mentioning that diesels tend to hold their value better than petrol cars too. The warranty period is a standard three years or 60,000 miles. Infiniti have been at the fringes of the luxury vehicle market ever since their European introduction way back in 2008. That situation is likely to change very quickly with the Q30. In a market where looks and individuality are what really sell, this Japanese premium brand's quirky style seems a perfect match to the demands of the consumer. That this style has matured into something so attractive in the Q30 won't do it any harm either. Good looks are all very well and good but you've also got to consider practicality too. Thankfully, Infiniti haven't released the Q30 with a range of thirsty petrol engines as they've done with other models. The pair of diesels in particular are exactly what are needed for commercial success. Add a high quality interior into the mix along with competitive pricing and we can see this being Infiniti's turning point in Europe.